In this tutorial we’ll go through the process of dressing a Multi-player Map (which can also apply to a single player map) using the World Builder. we’ll go through the most commonly used tools by artists. We’ll go through some basic things to make the Multi-player map work. 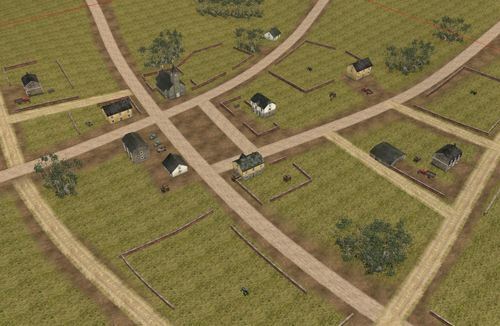 To launch the World Builder, navigate to your Company of Heroes 2 local files and double click WorldBuilder_CoH_2.exe. Alternately, the World Builder can be launched from the Tools menu of the Mod Builder. Click File then select New Multiplayer Map. Save your scenario to CoH2\Data\Scenarios\my_scenario\my_scenario.sgb in your Company of Heroes 2 install folder. You may have to create the necessary subfolders. 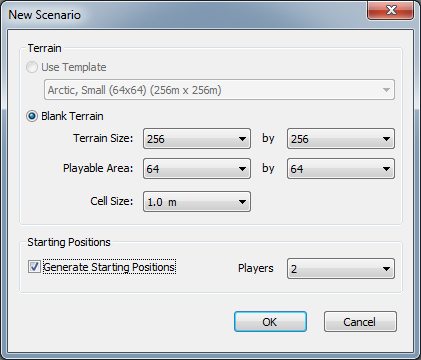 A new Scenario dialog will appear, select the Terrain Size and Playable Area for you scenario. 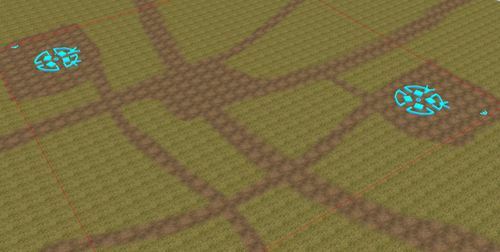 In this map we'll use 640x640 for the terrain size and 320x320 for the playable area. In any case It is recommended to keep the playable area under 512 x 512 for performance reasons. check the Generate Starting Positions box and select 2 Players. You have a map with two players and each color represents their territory. In this phase don't worry too much if your scene does not look nice right away. It's mostly to flesh out your map and decide where things will go. You may go through many iterations before you make it look the way you want. By default the players are in the middle but we want them to be on opposite sides of the map. The large Blue circle represents the base, so you want to leave some room around it. Place them on opposite corners without going to close to the edge of the playable area. The small half circle with an arrow are where your units going to spawn. We usually place them somewhere behind the base near the edge. The small x with the sandbags is the team's territory position, just leave it near the base, this is invisible. Hit Ctrl+F5 to hide the territory colors. Also turn of the fog to see things better. Select your Tiles Tool and go to the tools options on the right side panel. 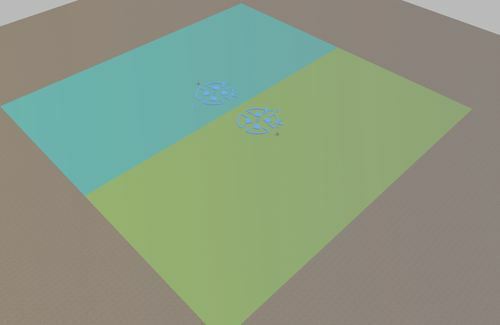 Under the Layers tab you can see the base texture that is all over the map, we can add some more tiles or replace it. select the current layer by clicking on it and choose another texture under the texture tab and hit assign. I like to use grass/grass_mixed_06 as the base layer for a rural environment. Repeat this last step for any new layer you want to add. Don’t add more than 12 layers. The less the better for performance. The first thing you want to do is determine roughly where your roads will be. Select your dirt layer and paint some roads, like on the image below. Select your Spline Tool and go to the tools options on the right side panel. Under the Modes tab select Texture. Under the Texture tab you have a selection of textures to choose from. Select road_asphalt/country_road_01 and right click four or more times on the ground drawing a spline and hit enter. 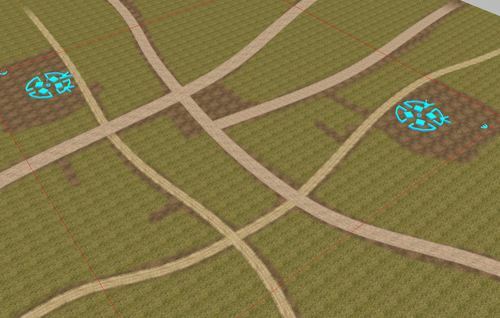 Draw the spline roads on top of your painted roads. Left click to select your spline, space tab to access to the control points to move them. Shift+ right click will make it wider or narrower, or you can set to optimum width under the shape tab. You may want to go to Texture Edit Mode tab and hit Fix tiling to Width every time you change the width of a texture spline. This will remove any streching. Under shape bar you can also add more control point to the front or back of the spline (add to front or add to back buttons). Don’t add too many points to a single spline, it does not like that. 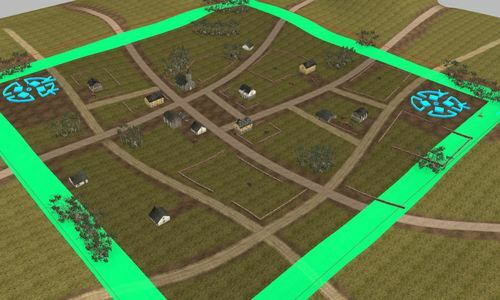 Add road_asphalt/country_road_01 texture to main roads and road_asphalt/grassy road_02_cover to smaller roads. Select your Object Tool and go to the tools options on the right side panel. Under the objects tab you have a selection of objects to use. right click on the ground to place your church. Make sure you don't add any buildings too close to the edge of the map. Left click to select it and drag it to move - shift+left click to rotate it. repeat the last two steps to choose other buildings and place them on you map. Note buildings are the most expensive of objects. Adding too many can cause performance issues. You can copy your building and place it in the map more than once. Select your building hit C and drag. 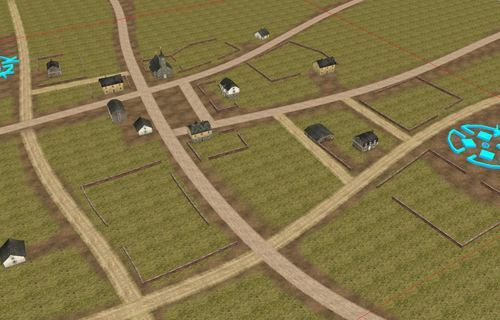 In this map there is a small town center and a few other houses near the roads. Adding Objects splines will provide basic cover and pathing. Under the Modes tab select Object. Under the Object tab you have a selection of Objects to choose from, but not all objects work well on a spline. Go to the Default tab and press the Add Object To List button. The brick wall will be the default object every time you draw an object spline. on the same Default tab check the Wall Mode and Adjustable to Terrain. Your wall will deform according to the terrain’s height smoothly. Back on the Modes tab make sure you check the box under Object. right click four times on the ground creating a straight spline and hit enter. left click to select your spline, space tab to access to the four control points. You can copy your spline by hitting C and dragging. You can rotate your spline with Shift+Left click. Draw some wall near the houses as fenced yards or fenced fields. Don’t worry about the actual object we can change this later. Make sure you leave enough openings for units to navigate through. Right now the map is flat, by adding elevation to the terrain we can add more realism to the scene. Select your Height map Editor and go to the tools options on the right side panel. Under Edit Modes set the Brush Size to the biggest to 64, the Feather to about 50 and the strength to about 80. You can paint elevation to the edge of you terrain making some light hills. Because your LMB Mode is set to additive and your RMB Mode to Smoothing, left click will add elevation and right click will smooth. You can alternatively set your LMB Mode to set value and enter a height number. Try 20 for example and paint some out of the playable area. Note, editing terrain take a lot of memory. If you feel you are running slow, save and close your World Builder and open it again. If you get an error message save and reopen your editor right away, you wouldn’t want to lose your work. select ebps/environment/art_ambient/objects/ and chose any object you want. You can place a few civilian cars from the vehicles folder and a few crates from the market folder. Remember this is just blocking the scene for now. These objects will provide some nice cover for your units. You may also want to add some large trees to fill in more space. Go to the Interactivity stage editor and go to the tools options on the right side panel. Set the brush size you want and paint a thick border at the edge of the map. Units cannot go in that area, it's mostly for camera purposes. Plan you map accordingly. With these basic elements you should be able to play your scene and iterate it as much as you need to make it fun.